It’s Only Life is a musical revue of John’s songs co-conceived and directed by Daisy Prince. It was developed at Musical Theatre Works and had a workshop production as part of 2004’s first Summer Play Festival in New York City. In late January of 2006, it was performed in a concert version as part of Lincoln Center’s American Songbook series and this CD was recorded by the PS Classics label (with that same amazing cast) the following week. The cast includes: Brooks Ashmanskas, Andrea Burns, Gavin Creel, Jessica Molaskey and Billy Porter. On this recording, these 5 accomplished singers bring their brilliant artistry to 23 songs accompanied by John on piano. There are vocal arrangements by Jason Robert Brown, Jeff Blumenkrantz and John. In the Summer of 2008 a more fully realized version of the show (newly orchestrated by Bruce Coughlin for 5 musicians) had a run at the Rubicon Theatre in California and was awarded the Los Angeles Ovation Award for best book, music, and lyrics of a new musical. For information on licensing a production of “It’s Only Life” please contact Rodgers and Hammerstein Theatricals at theatre@rnh.com or (212) 564-4000. A Piano/Vocal Songbook of the 14 pieces from the show not already included in the first “Grateful” songbook is also available through this website. I have loved John’s songs from the moment I heard them 13 years ago. His catalogue is staggering in number, variety and most important achievement. His voice is distinctly his own: intensely personal, soul searching, honest and just plain funny. In laying himself bare he has given tremendous company to all of us who know and love what he has written. Through the years John has developed an enormous following. I have always believed that, given the inherent theatricality of his songs, a musical revue would introduce John to a theater audience hungry for new, heartfelt and exquisitely crafted material. Together we imagined a show, which would, within a theatrical context, amplify his material. The final impetus for creating this piece was really demand. Many people had been asking John if there was an existing compilation of his songs that could be performed at their theater, University or concert hall. So, we set to work. I felt strongly that any imposition of story would be reductive to John’s individual songs. We wanted to create a dramatic arc and a sense of progression for the characters in our revue. Using “The Artist at 40”, “It’s Only Life” and “ A Glimpse of the Weave”, we employed a simple linking device that set a template into which the other songs would fall. The rest was fairly easy. Copious piles of songs were organized into other copious piles of “yes”, “maybe” and “not for this show”. What was left is a musical revue about longing, fulfillment, loss, triumph and ultimately wisdom—as told by a group of funny, insecure and insightful people. We decided, because for some reason it felt right, that we would use five actors in our production. The five performers on this album are as good as it gets. However, the show is designed so that it can be performed by however many people an individual director feels compelled to use, and in whatever venue fits their vision. 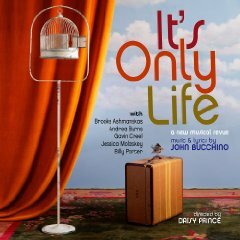 We have been fortunate that “It’s Only Life” has been mounted in full production at SPF in New York City and also in concert as part of Lincoln Center’s American Songbook series. Upon repeated listening, I hope you will find more and more of the somewhat buried threads that knit the individual stories together. I also hope you will love John’s songs and these wonderful performers as much as I do. “On the growing roster of younger New York songwriters jockeying for recognition in the gray area between the art song and pop, John Bucchino occupies a special niche. Mr. Bucchino, whose work was showcased by Lincoln Center's American Songbook series on Friday evening, personifies the therapy-sensitized, new-age-savvy metrosexual seeker of love and truth minutely cataloging his adventures on the street of dreams. Mr. Bucchino's flowing, finely made piano ballads describe an urban single life in which relationships come and go in cycles of yearning, fulfillment, heartbreak and healing. Romantic love is a serious quest undertaken as a race against time. In a burst of self-appraisal like "The Artist at 40," you can practically hear the clock ticking. That search for a lasting relationship is part of a deeper philosophical quest. Two of Mr. Bucchino's best-known songs, "Grateful" and "This Moment," describe personal epiphanies: yearning gives way to rapturous flashes of insight in which the songwriter recognizes life's blessings and realizes that the moment is all there is. But more often than not, he is dogged by insecurity and fear. Personal victories, like the sense of mastery expressed in his buoyant song "Taking the Wheel," are hard won. Mr. Bucchino's language sometimes verges on the flowery. "Grateful," with its hymnlike harmonies, for instance, conspicuously rhymes "truly" and "duly"; the song preaches gratitude. But Mr. Bucchino never wastes words. Songs like "Painting the Kitchen," an amusing depiction of home improvement as a therapeutic exercise during which the narrator carries on an interior dialogue with his therapist, emphasize his gift as a witty phrasemaker in the Sondheim mold. These were among more than 20 Bucchino songs woven into a suite in "It's Only Life" at the Allen Room at Frederick P. Rose Hall, where the composer, playing piano, accompanied five singers in a survey of his impressive output. As the show progressed, fragments from earlier songs were brought back as a linking device that gave the concert a steady dramatic arc. It’s been a dream of mine for many years to put together a revue of my songs. Now, thanks to the brilliance of Daisy Prince and the participation of some of the best performers around, we have It’s Only Life. We recorded the show on Feb. 1st and 2nd, 2006 in two intensely focused sessions. The singers did a miraculous job of capturing my intentions for the material while dramatically infusing it with their own personality and unique musical style. I couldn’t be more thrilled with the result. I hope you enjoy!